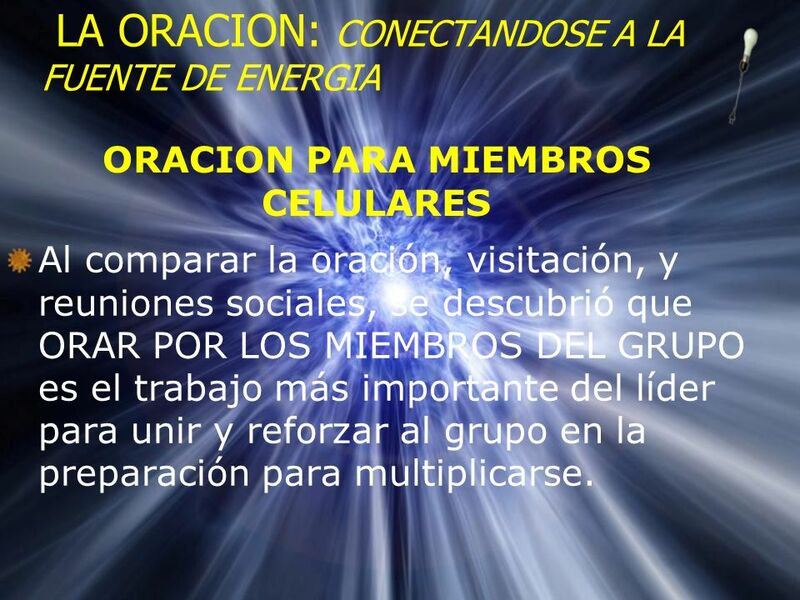 El Factor Principal en el Exito de Grupos e Iglesias Celulares Cho writes, "Many people criticized me because I was giving goals to my people then encouraging them to accomplish the goals. But if you don't give them a goal, they will have no purpose to being in the cell" (1995:18). He goes on to say, "Many churches are failing in their cell system because they do not give their people a clear goal and remind them constantly of their goal. 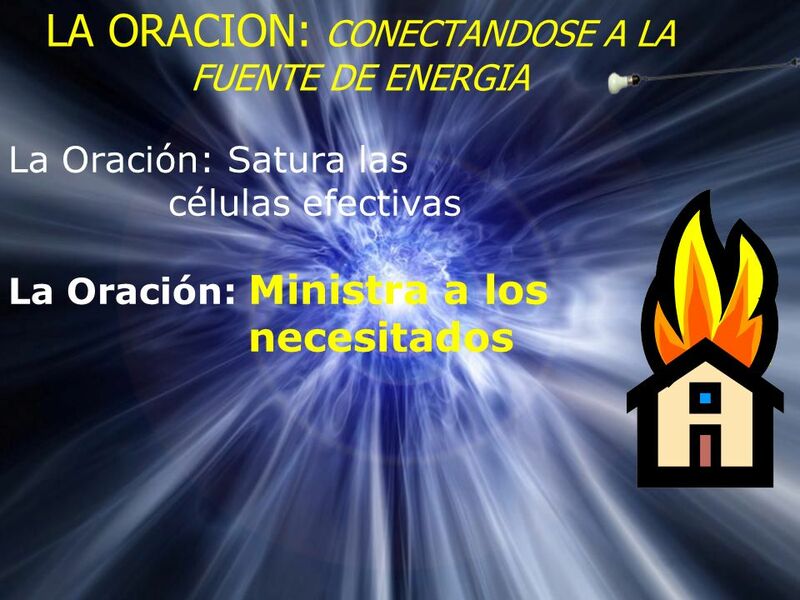 If they have no goal, then the people will gather together and just have a grand fellowship" (1995:18). This quotes stirs with me with passion because I have also noticed that the most radical, effective cell ministries today are the most goal oriented. 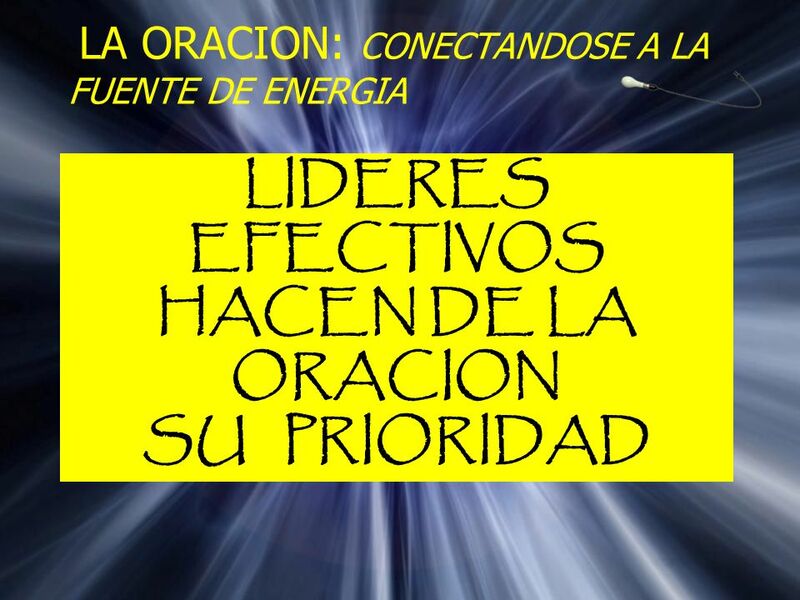 LIDERES EFECTIVOS HACEN DE LA ORACION SU PRIORIDAD Cho writes, "Many people criticized me because I was giving goals to my people then encouraging them to accomplish the goals. But if you don't give them a goal, they will have no purpose to being in the cell" (1995:18). He goes on to say, "Many churches are failing in their cell system because they do not give their people a clear goal and remind them constantly of their goal. If they have no goal, then the people will gather together and just have a grand fellowship" (1995:18). This quotes stirs with me with passion because I have also noticed that the most radical, effective cell ministries today are the most goal oriented. Pregunta en la encuesta: “¿Cuánto tiempo toma cada día en sus devociones? 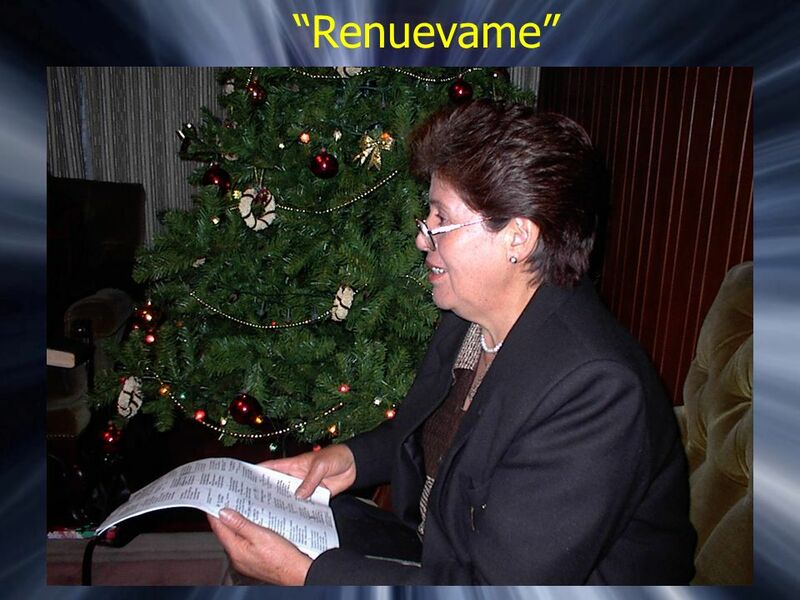 (ejemplo: en oración, en leer la Biblia, etc. ).” Cho writes, "Many people criticized me because I was giving goals to my people then encouraging them to accomplish the goals. But if you don't give them a goal, they will have no purpose to being in the cell" (1995:18). He goes on to say, "Many churches are failing in their cell system because they do not give their people a clear goal and remind them constantly of their goal. If they have no goal, then the people will gather together and just have a grand fellowship" (1995:18). This quotes stirs with me with passion because I have also noticed that the most radical, effective cell ministries today are the most goal oriented. 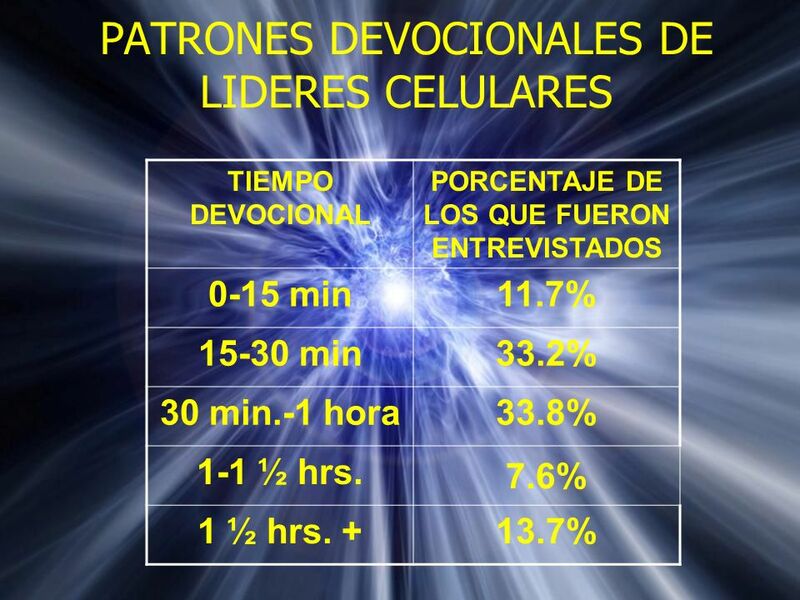 TIEMPO DEVOCIONAL PORCENTAJE DE LOS QUE FUERON ENTREVISTADOS 0-15 min 11.7% 15-30 min 33.2% 30 min.-1 hora 33.8% 1-1 ½ hrs. 7.6% 1 ½ hrs. + 13.7% Cho writes, "Many people criticized me because I was giving goals to my people then encouraging them to accomplish the goals. But if you don't give them a goal, they will have no purpose to being in the cell" (1995:18). He goes on to say, "Many churches are failing in their cell system because they do not give their people a clear goal and remind them constantly of their goal. If they have no goal, then the people will gather together and just have a grand fellowship" (1995:18). This quotes stirs with me with passion because I have also noticed that the most radical, effective cell ministries today are the most goal oriented. HABIA UNA CLARA RELACION ENTRE EL TIEMPO QUE TOMARON CON DIOS Y EL EXITO DE MULTIPLICAR O NO SU CELULA. Cho writes, "Many people criticized me because I was giving goals to my people then encouraging them to accomplish the goals. But if you don't give them a goal, they will have no purpose to being in the cell" (1995:18). He goes on to say, "Many churches are failing in their cell system because they do not give their people a clear goal and remind them constantly of their goal. 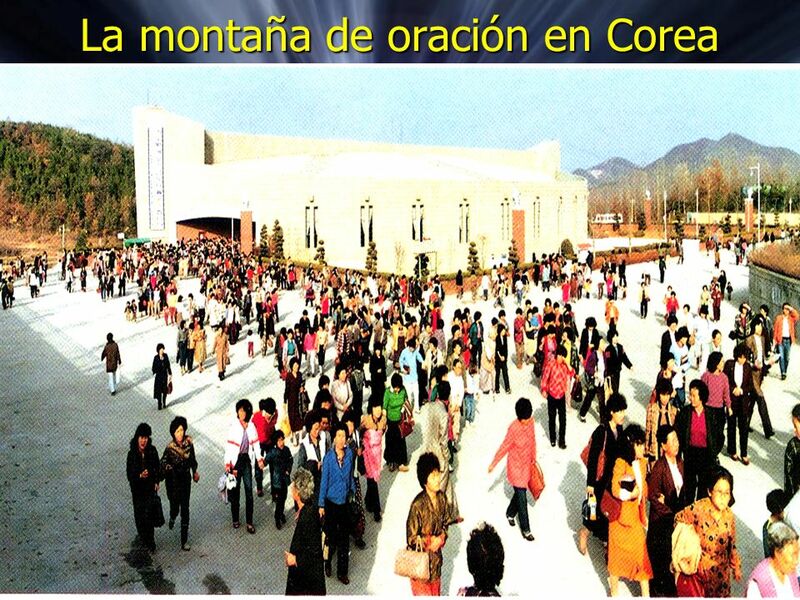 If they have no goal, then the people will gather together and just have a grand fellowship" (1995:18). This quotes stirs with me with passion because I have also noticed that the most radical, effective cell ministries today are the most goal oriented. 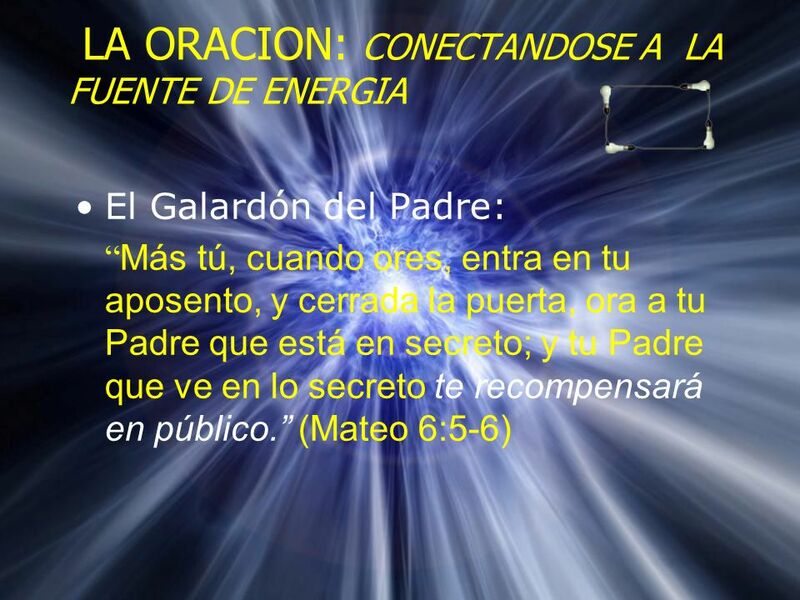 El Galardón del Padre: “Más tú, cuando ores, entra en tu aposento, y cerrada la puerta, ora a tu Padre que está en secreto; y tu Padre que ve en lo secreto te recompensará en público.” (Mateo 6:5-6) Cho writes, "Many people criticized me because I was giving goals to my people then encouraging them to accomplish the goals. But if you don't give them a goal, they will have no purpose to being in the cell" (1995:18). 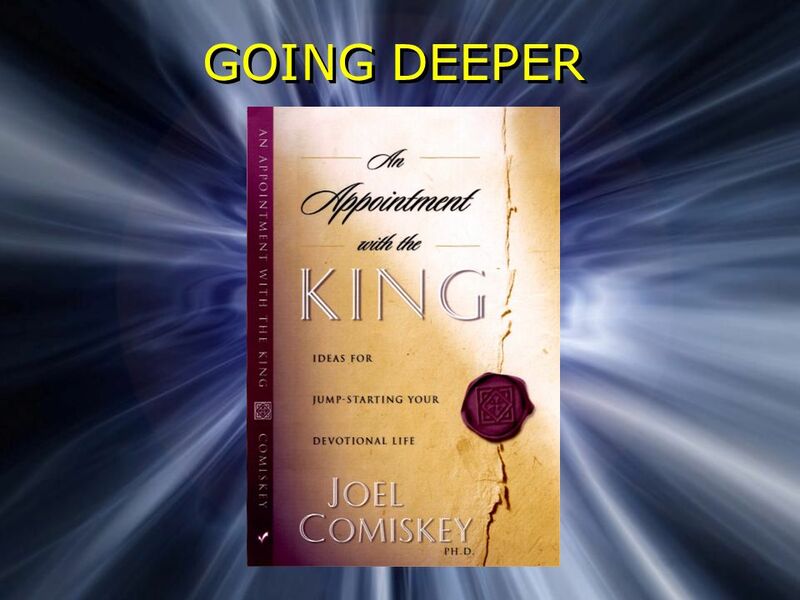 He goes on to say, "Many churches are failing in their cell system because they do not give their people a clear goal and remind them constantly of their goal. 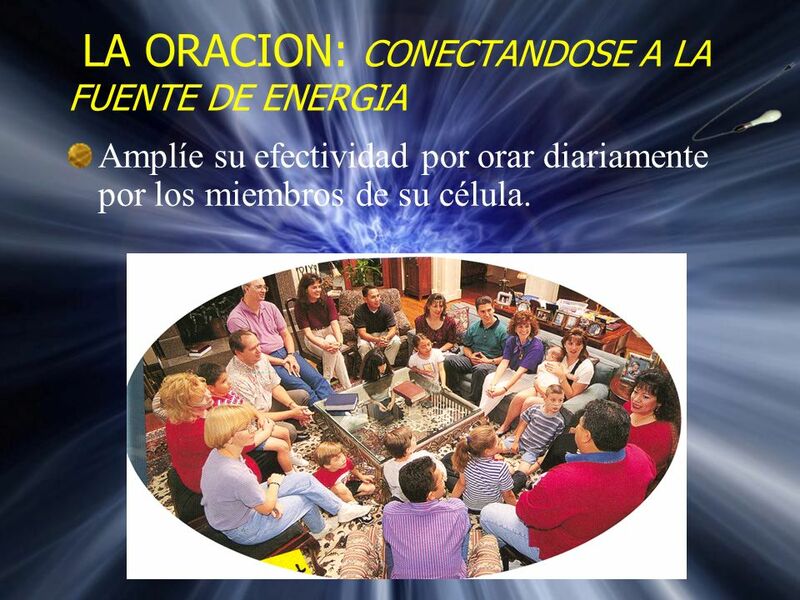 If they have no goal, then the people will gather together and just have a grand fellowship" (1995:18). This quotes stirs with me with passion because I have also noticed that the most radical, effective cell ministries today are the most goal oriented. 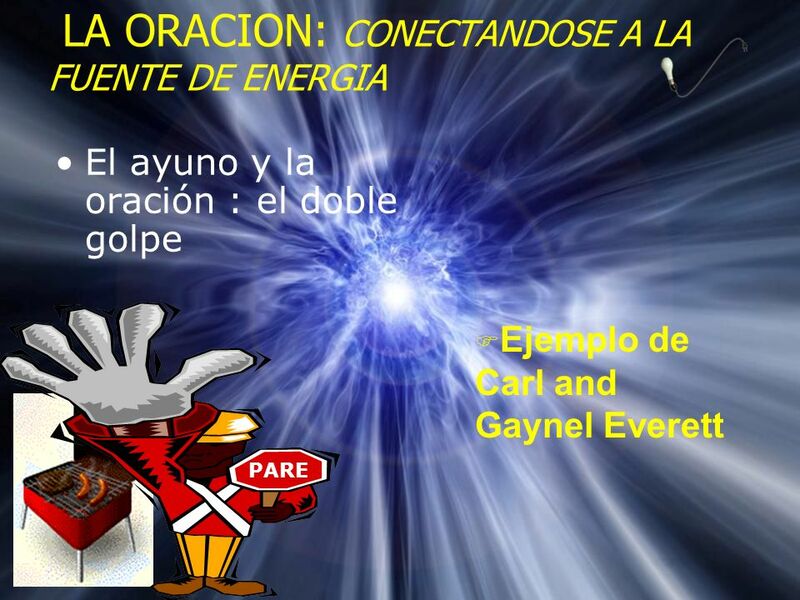 ORACION PARA MIEMBROS CELULARES Al comparar la oración, visitación, y reuniones sociales, se descubrió que ORAR POR LOS MIEMBROS DEL GRUPO es el trabajo más importante del líder para unir y reforzar al grupo en la preparación para multiplicarse. Cho writes, "Many people criticized me because I was giving goals to my people then encouraging them to accomplish the goals. But if you don't give them a goal, they will have no purpose to being in the cell" (1995:18). He goes on to say, "Many churches are failing in their cell system because they do not give their people a clear goal and remind them constantly of their goal. If they have no goal, then the people will gather together and just have a grand fellowship" (1995:18). This quotes stirs with me with passion because I have also noticed that the most radical, effective cell ministries today are the most goal oriented. Amplíe su efectividad por orar diariamente por los miembros de su célula. Cho writes, "Many people criticized me because I was giving goals to my people then encouraging them to accomplish the goals. But if you don't give them a goal, they will have no purpose to being in the cell" (1995:18). He goes on to say, "Many churches are failing in their cell system because they do not give their people a clear goal and remind them constantly of their goal. If they have no goal, then the people will gather together and just have a grand fellowship" (1995:18). This quotes stirs with me with passion because I have also noticed that the most radical, effective cell ministries today are the most goal oriented. 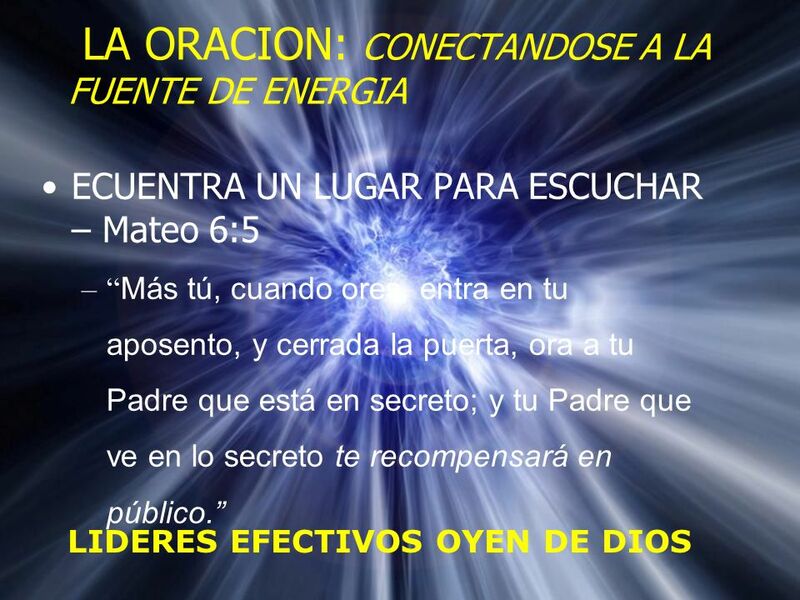 La Oración: Satura las células efectivas La Oración: Ministra a los necesitados Cho writes, "Many people criticized me because I was giving goals to my people then encouraging them to accomplish the goals. But if you don't give them a goal, they will have no purpose to being in the cell" (1995:18). He goes on to say, "Many churches are failing in their cell system because they do not give their people a clear goal and remind them constantly of their goal. If they have no goal, then the people will gather together and just have a grand fellowship" (1995:18). This quotes stirs with me with passion because I have also noticed that the most radical, effective cell ministries today are the most goal oriented. 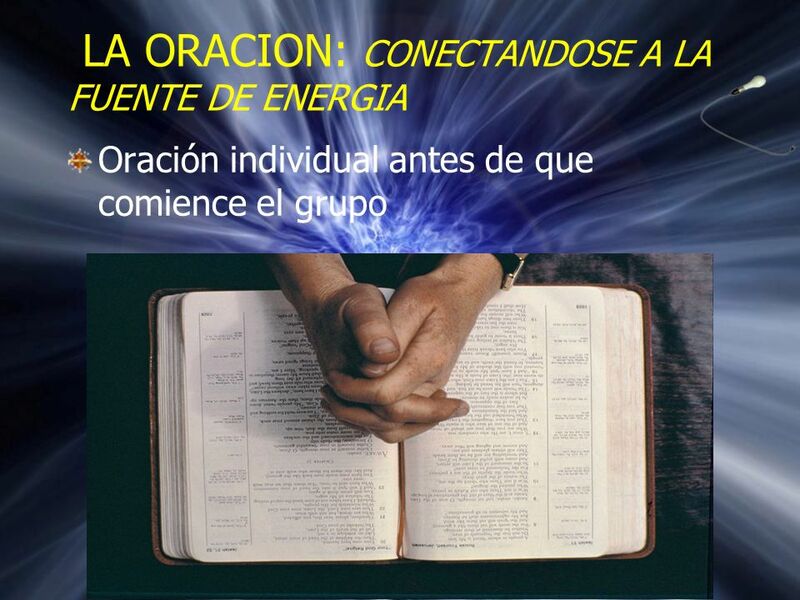 Oración individual antes de que comience el grupo Cho writes, "Many people criticized me because I was giving goals to my people then encouraging them to accomplish the goals. But if you don't give them a goal, they will have no purpose to being in the cell" (1995:18). He goes on to say, "Many churches are failing in their cell system because they do not give their people a clear goal and remind them constantly of their goal. If they have no goal, then the people will gather together and just have a grand fellowship" (1995:18). This quotes stirs with me with passion because I have also noticed that the most radical, effective cell ministries today are the most goal oriented. Su efectividad aumenta por tomar tiempo para orar antes de reunirse Cho writes, "Many people criticized me because I was giving goals to my people then encouraging them to accomplish the goals. But if you don't give them a goal, they will have no purpose to being in the cell" (1995:18). He goes on to say, "Many churches are failing in their cell system because they do not give their people a clear goal and remind them constantly of their goal. If they have no goal, then the people will gather together and just have a grand fellowship" (1995:18). This quotes stirs with me with passion because I have also noticed that the most radical, effective cell ministries today are the most goal oriented. 19 REFLEXION ¿Cómo se siente ante el hecho de que el tiempo devocional diario y la oración causa que los líderes multipliquen sus células más rápidamente? ¿Cómo le ha ayudado a Ud. El tomar tiempo con Dios? Cho writes, "Many people criticized me because I was giving goals to my people then encouraging them to accomplish the goals. But if you don't give them a goal, they will have no purpose to being in the cell" (1995:18). He goes on to say, "Many churches are failing in their cell system because they do not give their people a clear goal and remind them constantly of their goal. If they have no goal, then the people will gather together and just have a grand fellowship" (1995:18). This quotes stirs with me with passion because I have also noticed that the most radical, effective cell ministries today are the most goal oriented. 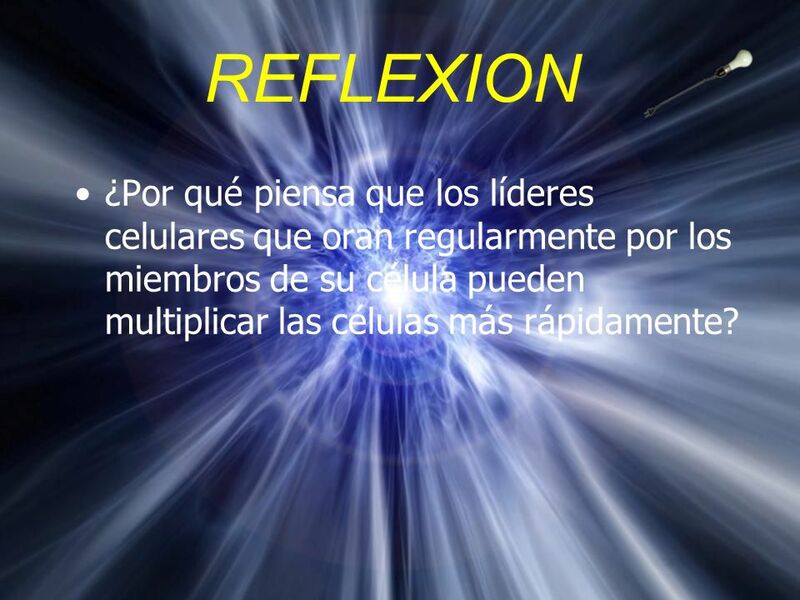 20 REFLEXION ¿Por qué piensa que los líderes celulares que oran regularmente por los miembros de su célula pueden multiplicar las células más rápidamente? Cho writes, "Many people criticized me because I was giving goals to my people then encouraging them to accomplish the goals. But if you don't give them a goal, they will have no purpose to being in the cell" (1995:18). He goes on to say, "Many churches are failing in their cell system because they do not give their people a clear goal and remind them constantly of their goal. If they have no goal, then the people will gather together and just have a grand fellowship" (1995:18). This quotes stirs with me with passion because I have also noticed that the most radical, effective cell ministries today are the most goal oriented. 21 REFLEXION ¿Cuán frecuentemente ora Ud. por los miembros de su célula (si Ud. 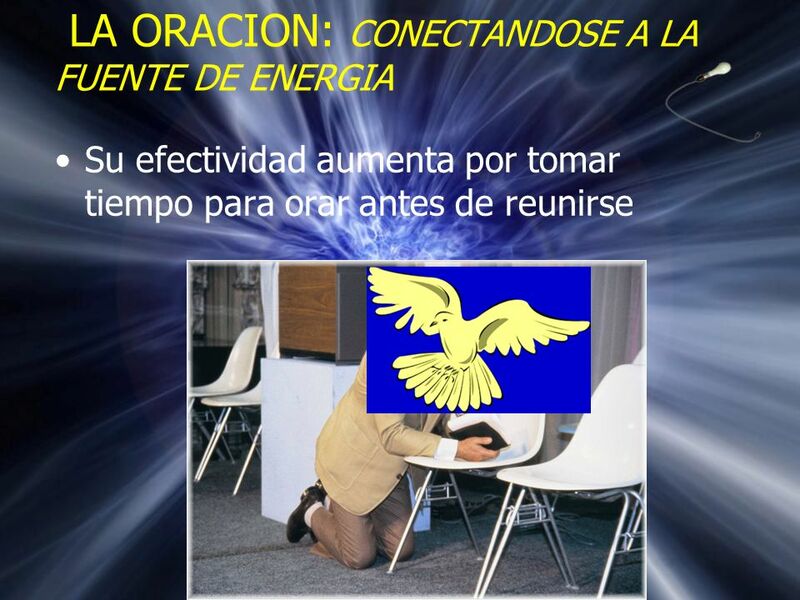 es líder de célula)? ¿De qué forma le ha ayudado la oración en su ministerio? Cho writes, "Many people criticized me because I was giving goals to my people then encouraging them to accomplish the goals. But if you don't give them a goal, they will have no purpose to being in the cell" (1995:18). He goes on to say, "Many churches are failing in their cell system because they do not give their people a clear goal and remind them constantly of their goal. 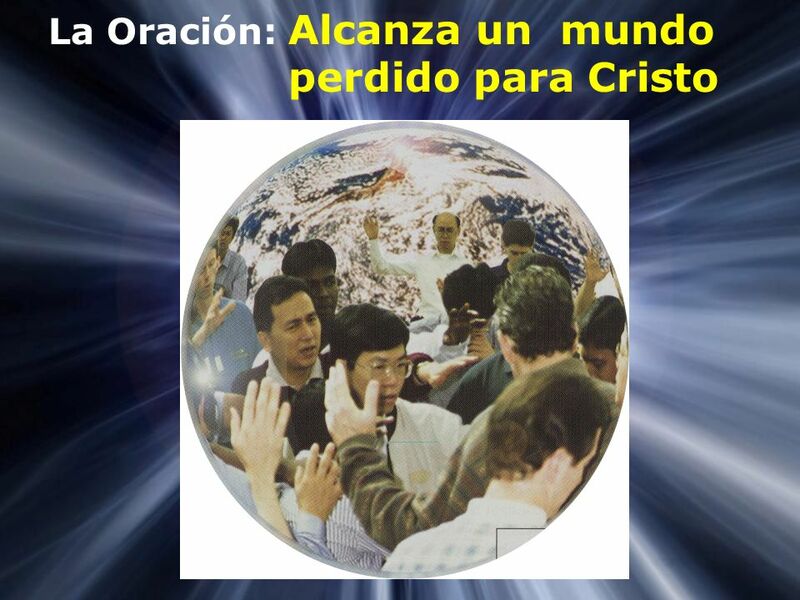 If they have no goal, then the people will gather together and just have a grand fellowship" (1995:18). This quotes stirs with me with passion because I have also noticed that the most radical, effective cell ministries today are the most goal oriented. 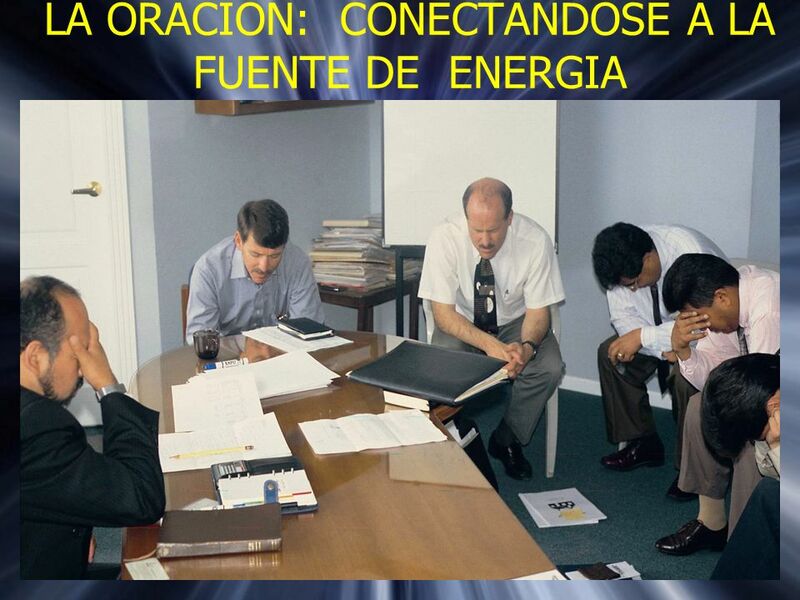 Descargar ppt "LA ORACION: CONECTANDOSE A LA FUENTE DE ENERGIA"
Nike y el Liderazgo Celular Efectivo: ¡Sólo Hazlo! Elementos Constitutivos del Mentoreo SESIÓN 4 JUNIO 2013.